Unforgettable experiences and unique activities! If you’re the active type or more laid back - these are five things to do in Bergen that you will remember forever. One of Norway’s main tourist attractions is Bryggen. These old harbour buildings are on UNESCO’s World Heritage list. (Like the pyramids of Egypt, The Great Wall of China and the Sydney Opera House!) 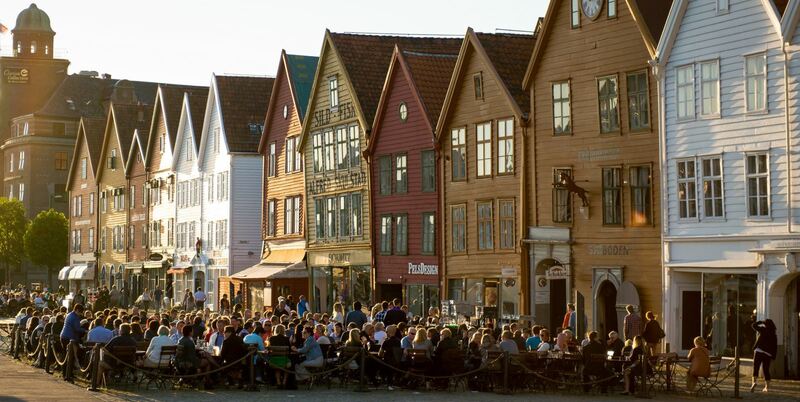 Every year, about 600,000 people visit Bryggen, and it is not hard to understand why. The unmistakable smell of weathered wood and tar lends the buildings its unique atmosphere. 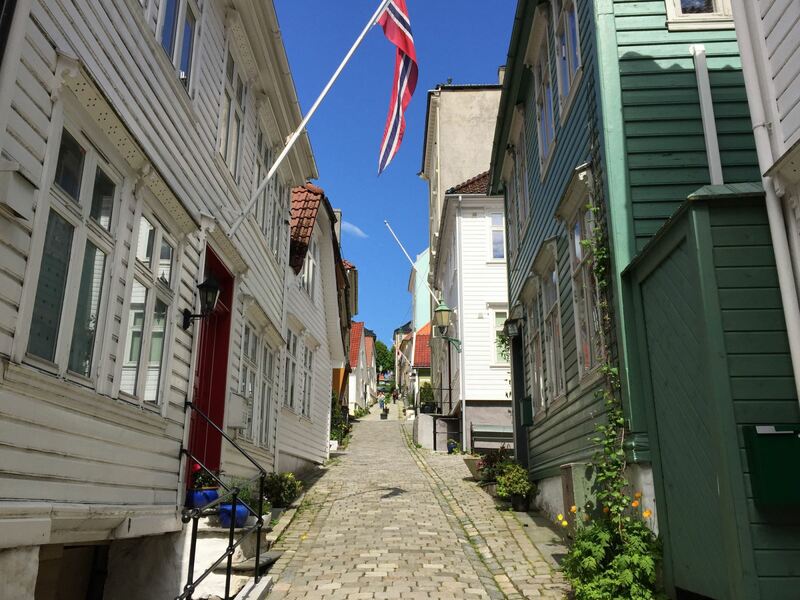 Walking the cobbled streets and alleys, you get to experience the same sights and sounds as the merchants who visited Bergen hundreds of years ago. When the weather allows, you can find a spot in the sunshine at one of Bryggen’s many cafés - perfect for some people watching, while boats of all shapes and sizes pass on the fjord Vågen. You can also go inside many of the buildings at Bryggen, where you will find shops, restaurants and outlets for products made by local craftsmen. Just next to Bryggen you find "Fisketorget" - the Fish Market, where Bergeners have bought their fresh fish and other goods over the years. These days, you mostly find seafood and other local delicacies here. And luckily for you, you can taste it all in one of the many outlets and food stalls open during the summer season. Nothing beats fresh seafood served right next to the fjord. Afterwards, the rest of the city is on your doorstep, ready to be explored and experienced. Bergen is surrounded by mountains; it is one of the things that make this city so unique. Several of the mountains surround the city centre, such as Mount Fløyen and Mount Ulriken. These are popular attractions for tourists and Bergeners alike. To get to the top of Mount Fløyen, you can take the 100 year old Fløibanen Funicular, which winds its way straight up the mountainside. In just 6 minutes you are taken from the city streets to “the roof of Bergen”, and the view is quite simply unbelievable. 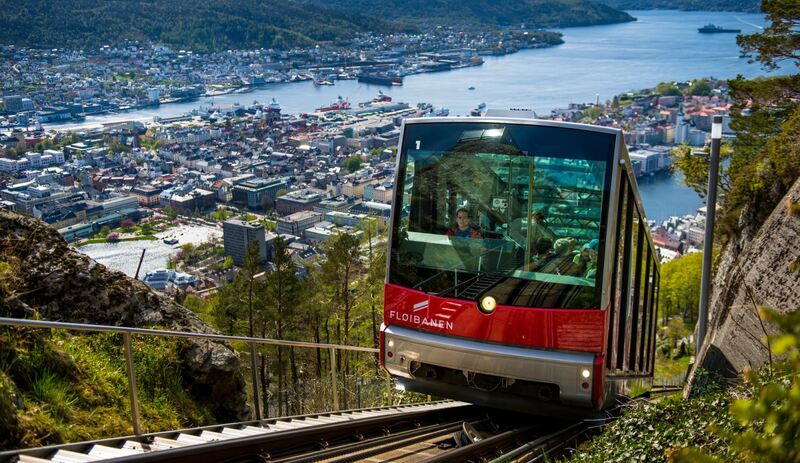 Many choose to take the Fløibanen Funicular to the top, and then walk back down to the city centre again. This is a beautiful walk, taking about 40 minutes. 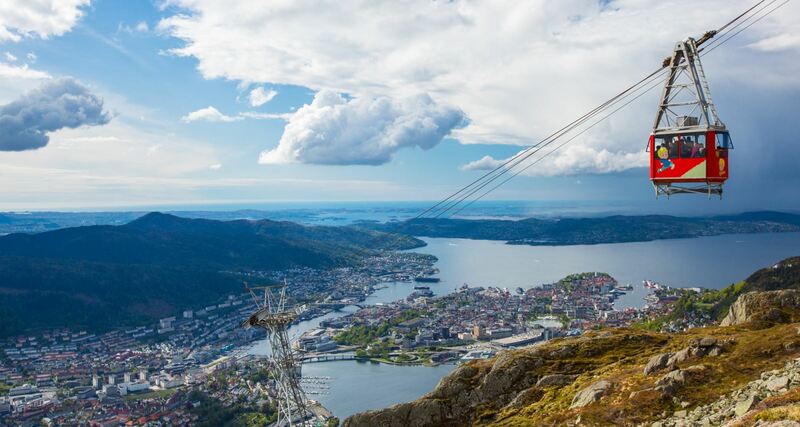 Another unique activity is the Ulriken Cable car, where you really feel a tingle in your stomach as you swing in one of the gondolas high above the ground. The cable car takes you to the top of Mount Ulriken in about 7 minutes, and when you get there, you are treated to amazing views of Bergen. There are also trails to the top, for those in the mood for a mountain hike. See the fjords from the best vantage point! Bergen is situated between the two beautiful fjords Sognefjorden and Hardangerfjorden, and is therefore a perfect starting point for experiencing them. There are boat trips and expeditions for every taste, for example a three-hour boat trip to the Mostraumen stream or the round-trip Norway in a Nutshell®. If you like the more active tour, you can take the same route but combine it with cycling and a RIB tour. Check out the large selection of fjord tours available and book your cruise online. If you like strolling around the city, you can easily walk from the centre of town to places like Nordnes. Nordnes is one of the oldest parts of town, and is home to the Bergen Aquarium, where you can meet a multitude of creatures. Book tickets for the Aquarium at visitBergen.com. The oldest buildings in Nordnes date back to the 12th century, when King Øystein was on the throne. Also, if you want the best views of Bryggen, you will find the best photo opportunities from Nordnes. Another pretty part of town is Sandviken (just above Bryggen). You’ll be surprised at the number of winding, narrow streets that make up this neighbourhood. If you follow the cobbled streets a few hundred meters up the mountainside, you will be rewarded with a fantastic view of Bergen, and yes, it gets even better the further you walk! There are obviously so many more than five things to do in Bergen, but now you have some activities to start off your stay in the “city between seven mountains”. Need more suggestions? Check out 10 things you can do for free in Bergen.